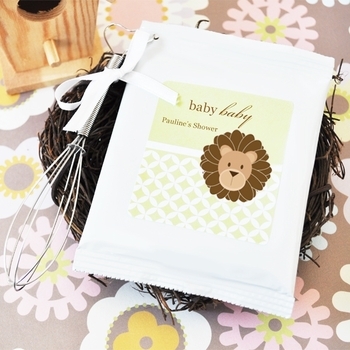 Choose from a variety of adorable animal images including a birdie, an elephant and a lion, they come in delicately hued colors to create the ideal label for your shower favor. Personalize the label with the name of the baby and shower date. For a truly special touch, add the optional mini whisk with heart handle priced at 75¢ each. The whisk comes with a white satin bow and the heart-shaped handle has a small opening that can easily be inserted through a hole. Simple assembly is required; merely punch a hole in the hot cocoa package and insert the heart handle of the whisk through it. Each white gloss package contains a 1 ounce single serving of luxuriously decadent hot cocoa powdered mix. Directions are included on the back of the package.